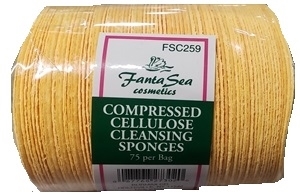 These cellulose sponges are compressed in such a way, to save space and unnecessary packaging. They instantly expand with a touch of water. Much more sanitary than traditional clothes. Effortlessly removes cleansers, creams, lotions, gels, oils, and masks. Cellulose construction is perfect for trapping crystals and beads used in facial scrubs.